TPS Publishing and Partners' Creative Core Curricula have now been adopted in California, Georgia, North Carolina and Florida. The Creative Core Curricula for Mathematics with STEM, Literacy and Arts and State Standards Aligned Science programs in Texas and North Carolina are all STEAM programs. The TPS Forensic Science TEKS aligned program is the only Texas State Adopted High School Forensic Science program. We offer middle and high school Forensic Science programs for All States. 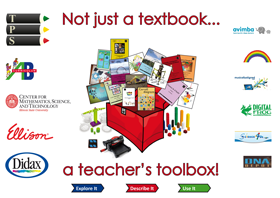 TPS Publishing and partners now have Grade K-5 Spanish traditional textbooks, STEM guides and Arts projects all fully aligned to the Common Core State Standards for Mathematics. For this competition, students are being asked to design a cover for their Science textbook. Competition details: A student can only apply for their own grade level. Students need to include their name, school name, school address and grade level with their submission. Students can submit their designs in a variety of forms: photograph, JPEG file, design and photograph a STEM or Arts project they have created, or paint or draw the cover. Submissions must be in by the end of April 2016. Winners will be announced by the end of June 2016. Each student that wins will be awarded $50! (Maximum per school payment of $250). For this competition, we are asking students to write a chapter for our new Forensic Science activity reader book. Create a story, together with assessment pages, for crime scene processing, for middle and high school students. You must include two different levels of assessment (e.g. for at grade level and above grade level learners), which uses the same story. You must make sure that the content all aligns to the CTE TEKS. These TEKS can be downloaded at the Texas State Education website or we can send them to schools if preferred. TPS will include the winning chapters in a new student created publication within their adoption submission for the CTE in Texas in 2016. The writers, as a group, will receive 8% author royalties and the teachers/parents can decide if these winnings are donated to charity, used for a school field trip, or paid to the group of students in book tokens. Each student name, grade level and the name of the school will appear in the credits. The school will be required to assign rights to TPS so that they only appear in the TPS program. All applications are required by the end of December 2015. For this competition schools are required to book a webinar or in-school visit, to have students build a spaghetti tower. The spaghetti tower must be built within 20 minutes, as tall as possible. The group with the winning tower will receive either a set of STEM or Art project materials for one class of 30 students at their school. Once each piece of material is taken it must be added to the “spend” total, however it can be broken into pieces without incurring extra charges. You must build, spend and be under budget, or the height will not count! Results can only be submitted either during a scheduled webinar or visit with TPS Publishing.